The striking thing you see at first glance looking at this splendid billiard table B_ig of MBMBiliardi is definitively the design of external form. Such attractive and contemporary in its soft lines and sinuous curves. Designed more than twenty years ago by designers of MBM, retakes the form of antique gradual pyramids. From initial and timely idea, which perfectly was reflecting the pyramidal characteristics, over the years it took up the evolution of design and technology. Its sinuous forms design this billiard table and make it so elegant. The leather which covers it, is signed by the best Italian tanneries. The wrapped and round legs, without facets are shaped one by one by foundries of historical tradition and are polished by skilled artisans. Unique as the precious stone from which it takes its name. Shapes, corners, tips and facets, softened by a soft leather, signed by the best Italian tanneries. “Par” in Golf parlance is the sum of attempts to complete a hole on a soft meadow, in shadow or on sun, maybe satisfied also by the light breeze. It takes his name from the class who defines it. Thanks to his magnificence,greatness and high professionality,pointed up by his powerful legs molded one by one in traditional historical foundries and brought bright by expert artisans, Class PRO reached his expression of perfection,power and elegance with a unique design. Paris has always attracted and inspired the artists and enamored from all the world. Each its corner, every its bridge, every monument was celebrated as a loved woman to madness. 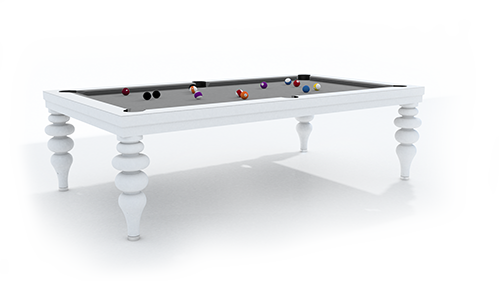 The design billiard table characterized by simple forms and modular components searching the creative contrast and using the combination. Shangai today is the most populated city in the world, with its 23,7 millions of inhabitants. From the idea of innovation and future which today make this city one of the biggest economic powers born the billiard table made from elements of solid beech wood. Billiard table Capri is born from the long time experience of MBMBiliardi matured in many years. Everything in Dubai is made to impress. Billiard table from our City Line is inspired from this splendid city. Everything in Dubai is made to impress. Billiard table from our City Line is inspired from this splendid city. Sinuous and endearing lines, the daintiness and lightness of glass, the different accurate finishes makes this billiard not only of high performance but also suitable for all types of refined and luxurious areas.